The Hitman’s Bodyguard is a two-hour assault of Looney Tunes-style violence. It’s one of those movies that no doubt looked great on paper. Get Ryan Reynolds to deliver his usual dry humor and facial expressions. He can be a down-on-his-luck bodyguard named Michael Bryce who lost a valuable asset — let’s make him an Asian arms dealer — and Michael quickly fell out with the industry. Catching up with him two years later, he’s no longer rated “AAA;” his car’s a piece of crap and his fashion watch is all scratched up — but at least he has a bottle to pee in. Oh. And throw in love trauma. He blames the love of his life for ratting out his asset, leading to the demise of both the asset and his career. But... Even so, he still loves her. He affectionately has her listed on his phone as “Pure Evil.” Let’s see… Let’s make Amelia Roussel an Interpol agent. Yeah. That’s hot. And the actress we get will be hot, too! Do you think we can get Elodie Yung? Next, pair Reynolds with Samuel L. Jackson. He can play a role he’s really good at: He can be Samuel L. Jackson. But this time we’ll call him Darius Kincaid. He’s a contract killer — and it’d be a hoot if we established history between the two. Say Michael was almost killed by Darius on 28 different occasions. Awesome. And Darius, of course, needs a love interest. Let’s get Salma Hayek to play Sonia. Yeah, she’s 18 years his junior, but she can drop “F” bombs with vigor and salsa. So... Let’s put Reynolds and Jackson together on a mission. Reynolds has to cart Jackson from a prison in Manchester to the International Criminal Court in The Hague in order to testify against the former president of Belarus, Vladislav Dukhovich. Let’s bring in... uh... Gary Oldman for that role. He can put on an Eastern European accent while also giving us some gravitas. To make it interesting, let’s say Reynolds only has 24 hours to get Jackson to The Hague or else the case against Oldman will be thrown out for a lack of evidence. Of course, Reynolds and Jackson can’t just hop on a plane. That’d be silly. Let’s make it rain! Bullets! Yeah. Well. The reality is The Hitman’s Bodyguard misses its mark more often than not. The basic premise doesn’t hold up to much scrutiny. It’s ludicrous Darius and what he has to offer against Vladislav would be handled at the last minute in a case of such significance. It’s a flimsy idea from jump street. In totality, this a disappointing entry for director Patrick Hughes, who made the egregiously underrated Expendables 3; that one’s a highly-entertaining romp. This one wants to romp, but it mostly flails about while making noise. A lot of noise. This is one bullet-riddled movie with blood or “F” bombs (sometimes both) in virtually every frame. Somebody needs to have an intervention with Jackson. His dropping of MF’er bombs every other sentence gets old. Quick. In fact, it actually became a little old sometime around the rolling of the end credits to Pulp Fiction back in ‘94. It’s so tired. Jackson is now merely a caricature of himself, which is a shame. He is capable of so much more than this tripe. In fairness, at least his performance here carries a little more weight. Albeit, it’s by way of a paunch which seems to have recently endowed his waistline; the camera does what it can to keep it out of frame, but those full-body shots don’t lie. Recent action flicks like John Wick and Atomic Blonde have spoiled audiences with a fresh take on the action genre. They pack character and a whole lotta style visually and aurally. 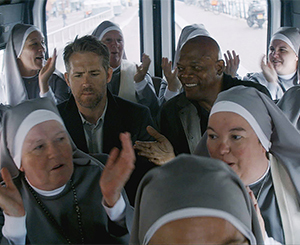 The Hitman’s Bodyguard is in shambles in comparison; it leaps all over the place in attempts to hit on something that’ll get a reaction, any reaction. The soundtrack is a loud mess of discordant musical selections, a blend of the blues, pop and death metal that never gels as elegantly as the musical cues in Atomic Blonde. This Bodyguard’s panache goes missing in action. More precisely, it’s wiped out like a valuable asset in the early going. As such, the highlights are limited. And there is a moment that ranks as borderline classic. While closing in on The Hague, Michael hotwires a Ford C-Max, which he figures is less conspicuous than the Jaguar parked nearby. But he fails to account for the Ford’s lack of performance features. In short order, right out of the garage, the C-Max crashes and the airbags go off. In another scene, Michael goes flying through the windshield, drops and rolls, then gets right back up. The shock value comes from the abruptness of the collision, but the absurdity of it all ultimately reveals The Hitman’s Bodyguard as nothing more than a live-action cartoon, one that’s filled with non-stop violence, incessant gun play, gratuitous bloodshed and tiresome coarseness.